Physical characteristics: Red-billed oxpeckers have olive-brown or gray-brown upperparts, a red short, thick bill, red eyes with very noticeable yellow circles of flesh around the eyes; light gray-brown wings and tail; tan or pale yellow rump and breast, and gray legs and feet. Juveniles have a dark bill and eyes, and brown area around the eyes. Adults are 7.5 to 8.7 inches (19 to 22 centimeters) long and weigh between 1.5 and 2.1 ounces (42 and 59 grams). eastern and southern Democratic Republic of the Congo to northern and eastern South Africa. Habitat: Red-billed oxpeckers live in open savannas, bushlands, and forests (up to elevations of 9,000 feet (2,745 meters) that contain large mammals including domestic livestock. Diet: The birds feed on parasites (organism living on another) such as ticks, fleas, and other biting flies taken from host mammals and on host blood and dead tissues and skin. They can eat hundreds of these parasites each day. Behavior and reproduction: Red-billed oxpeckers remain in the same area and do not migrate. They live alongside large mammals and are often found perching (sitting) on the heads and necks of rhinoceros, elephants, giraffes, and cape buffaloes. Courtship often takes place on the backs of these host mammals. Breeding occurs at different times in different areas, often at the beginning of the rainy season but has been reported in all months. They build nests in natural tree cavities made of grasses lined with hair and dung. Females lay one to five creamy white eggs with brown to lilac speckles. The incubation period is twelve to thirteen days, and is done by both parents. Both parents and helpers feed the young. The fledgling period is about thirty days, but remain dependent on the parents for another thirty days. 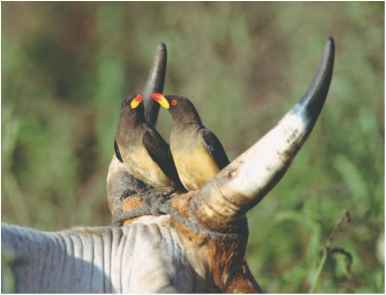 Red-billed oxpeckers and people: People often consider red-billed oxpeckers as pests, especially around livestock. Extermination programs have been carried out in various agricultural areas to kill off the birds. Orioles and figbirds are thrush-like birds in size and shape. Adults have patterns of brilliant yellows and blacks, while juveniles (and some adults) are streaked near the abdomen. 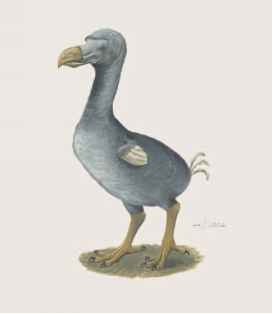 They have long rounded wings and square-tipped, twelve-feathered tail. The tenth primary feather is well developed, while the number of secondary feathers is usually eleven in orioles and ten in figbirds. Bills are straight, stout, and notched at the tip of the upper mandible (top part of a bird's bill). On the sides of the bill are bristles and narrow nostrils that are partly protected by a membrane. Their feet are stout, but shorter than the longest toe. Adults are 7.0 to 11.5 inches (20 to 28 centimeters) long and weigh between 2 and 5 ounces (50 and 135 grams). Orioles have brightly colored yellow and black plumage (feathers), a brick red bill, and slate gray feet. Male orioles are more brightly plumaged that females and have a bare patch of red skin around the eyes. Juveniles have brown-olive backs with dull bill, eyes, and feet, and a white abdomen with dusky streaks. Figbirds (and some orioles) have black or slate-colored bill, sometimes pale eyes, and flesh-colored or black feet. Males have a black crown (top of head) and bill, an olive back, and yellow, white, olive, or gray breasts, while females and juveniles are plumaged like juvenile orioles. Orioles and figbirds are located throughout the far northwest Africa and the sub-Saharan, temperate Eurasia (except its phylum class subclass order monotypic order suborder family central deserts), south and east to India, Southeast Asia, and Indonesian archipelagos as far as New Guinea, and north and east Australia.